More often than not, people dive into the world of social media to hopefully drive people to them, their message, and their product. However, it is when they figure out that the beauty of social media is when one adopts a posture that rather instead, drives them to others. It really is something to see that whenever we have a tweetup (a public, yep you guessed it, in person gathering of Twitter users) I always get asked by first time attendees as to what they are supposed to do. That being said, don’t get me wrong, for organizations using social media, of course one wants to drive awareness. However, I believe that the key to organizations using social media successfully is found with using social media like you’re an individual and not a brand. In this, how can an organization, brand, or product begin to think like a person and not like a thing? I know it sounds so simple, but it’s true. How often have you been turned off by an organization, brand, or product using social media like an organization, brand, or product? And further to the point, how unique and refreshing did it seem when you encountered an organization, brand, or product that used social media like a person? With this, which breeds loyalty and which just creates noise? The also can be said for this new digital frontier now being amassed by countless affiliate marketers. Note to you: When selling your product using social media, think and act like a person, not an, organization, brand, or product. 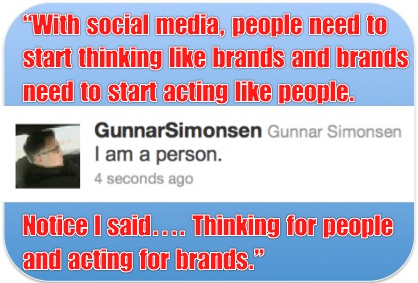 With social media, people need to start thinking like brands and brands need to start acting like people. Notice I said…. Thinking for people and acting for brands. With our viral footprints out there for the world to see, individuals need to understand this as it can impact your life in many ways. That being said, so can an organization make an positive impact if it simply began to act like an individual. I mean, social means social, right? In doing this, this builds credibility, trust, and loyalty in the long run. Why did you dive into social media? In how you are driven to others will determine how they will be driven to you. Thank you so much for stopping by and posting that!! That really encourages me.